Q: Any memorable game on the sidelines stands out to you more than another? I remember that conversation with him very well because it was kind of a bold statement. Because Miami had everything: they hadn’t been beaten in the Orange Bowl for a long time and they were pretty talented, and we had a bunch of farm boys and just hard workers where you looked at them and went, “Boy, they don’t look very athletic. But the kids can play, you know?” And that was a huge deal, because that’s what Nebraska was about. Just a bunch of hardworking guys and a few pretty talented athletes to fill in the gaps there, and away we went. Q: Tell me about the field there. Was it sandy like it was in the ’84 Orange Bowl? I remember Jeff Smith just kicking up sand while running in that game! RG: Yeah, it was pretty much painted, green sand. Q: Do you think that affected our guys in those games? RG: I don’t think so. Somebody tried to write a story and made a big deal out of nothing. A lot of it was that we played against the warm weather schools in the warm weather. Before (we had) the Cook Pavilion we were trying to work out in a little crackerjack box or outside in the elements, so that made a big difference. Q: You know, the Boston Celtics always had the pink visitor’s locker room and the old parquet floor with the dead spots, and Notre Dame always had the natural grass that was grown very high and thick-like, so I wanted to know if that Orange Bowl field had any unique qualities. RG: No, I think it was reporters trying to make a bigger deal of it than anything else. Q: And funny sideline moments stand out to you? Q: Were you a “Get Back” Coach? RG: Oh, yeah. I was the “Get Back” Coach for a loooong time. Q: Any away games, fields or fans where the TV cameras didn’t effectively show the environments as they truly were? Anything stand out? RG: The worst ever was Penn State. Their fans were horrendous. Never, ever have I been around the fans after a game where they came and… they had no crowd control for one thing. Our players were getting pushed around. They were getting cussed at and screamed at. It was the closest to people getting hit that I’ve ever seen. LSU fans, even after we beat the crap out of them, they were still drunk in the hotel, screaming “Tiger Bait!” to us afterwards. I don’t know if they even knew what happened at the game. Some of the best ones were our so-called worst enemies: Oklahoma. Some of the best people and the best friends I had were the strength coaches at Oklahoma back when Barry Switzer was there. We had a great time with them. They respected us, we respected them. We’d get together and party before the game. It was easier to take it from those people because they knew how to win and they had some class, whereas some of these others didn’t. Q: Anything about the other coaches from that time? Q: And ten minutes later he was hugging them, right? RG: Oh yeah, and they both loved him. They come back and visit him. I got to be good friends with Charlie as the years went along, and we get to see each other and chit-chat now and then. Q: Most memorable or favorite game? Favorite player? RG: There’s a lot of them. The Florida game, watching Tommie Frazier was real special, too, another one of those games where no one thought we had a chance. I talked to Frank Solich before the game and I asked him how he thought we were gonna do and he says, “We’ve got a plan.” And I go, ‘Yeah? What is it?’ And he goes, “Well, we’ve been watching them and we think they’re a little soft. We figure if we can come out and smash them in the mouth, they’re not gonna like it too much.” And that’s exactly what we did. And once I think about it, my favorite player of all-time was probably Mike Rozier. To this day, Mike is still a happy guy. I just loved seeing him and he was so much fun to be around. I can remember him, he’d have the whole huddle laughing when we were playing Oklahoma. He’d come into the weight room and just be hilarious. He was such a tremendously talented guy, physically, but he always had that happy attitude. I still tell people he was probably my favorite player. Him and John Parrella. John was a great guy, too. They were wild, but they were wild in a good way: they kept things fun for everybody, too. They worked extremely hard. Q: Any memorable off-field stuff? Bowl trips? Q: Now Randy, were you one of those guys who drove the semi-truck down to the bowl game with the weights? So he pulled over and started getting me through the gears, and then he laid down and slept. We were going down the Florida Turnpike and he slept for about 4 hours. Well, he woke up and crawled onto the passenger seat, and just then a Winnebago cuts right in front of us. And he says, “F### that sonuvabitch!” So I pull out and he says, “Okay, speed up. And when your back wheels of the trailer get right next to this guy, just turn the wheel a little bit and watch what happens.” Well, turning the wheel a little bit causes the trailer to swerve about 6 or 7 feet both ways, and when I did that the Winnebago pulled over onto the side of the road. And the guy goes, “That’ll teach him!” (laughs) And that’s how I learned to drive a semi. Q: (laughing) Now, the smaller, skill-position players you worked with… any guys stick out as far as their attitude, leadership, mindset? RG: Wow, there were so many over the years. Both Tommie and Brook were great guys, you know? Tommie wasn’t sometimes the most popular guy because he was pretty demanding, but he’d never demand anything less than what he would do himself. Brook was the quietter guy, but would push himself just as hard. Damon Benning, Lawrence Phillips, the Makovickas were hard-working guys. So many of them just did what you asked of them. They’d run through a wall for you. Matt Turman, a good guy, worked hard and gave it all he had. They were all a lot of good buddies. There were some great defensive backs, too. There were so many of them that were just awesome to work for. They pushed themselves, they pushed the linemen. They’d step up and challenge the linemen to anything, anytime. It went both ways, so that was pretty cool. And some of the guys who didn’t see the field worked their butts off just as hard as anybody else. I wish I could remember some of their names, they stand out to me, I need to get a roster and look at some names. Q: Anything about recruiting stand out? RG: Well, Boyd being Mr. Show Business and Mr. Promoter always made it a big deal for the kids with the recruiting demonstrations before the games on Saturday. It was really cool, because that’s where I really got to know Kenny Walker. And there was a tight end, Sheldon Jackson, who painted his fingernails. Sheldon did a great job in those demonstrations. He’d come in with his fingernails painted sometimes, in front of the whole recruiting class and parents and everyone watching. And that’s actually how we got the money for the weight room expansion in ’91 or so. George and Dan Cook came to the weight room and wanted to see the demonstration so Boyd let them come in, didn’t know who they were and started talking to them and the Husker Power Club people and how we were trying to raise money, and that’s how they got hooked up with the Cooks and got that all started. Q: Anything else special about those years, those players, their unity? RG: I always tell people about Coach Osborne’s philosophy. And it was really true when we won the first national championship, because in some ways it was the worst letdown of my life: because it didn’t change. Yeah, it was fun we won it all that night, it was a big party. And the next day and getting back to Lincoln was exciting. But two days later we’re back in a meeting talking about winter conditioning and what we’re gonna do about this and that for next year. That’s how it was, and he talked about that. And I even try to convey this to my son and his teams: it’s the competition all the way through. That’s what it was really about. And you start to think about it, every week and how exciting it was, the questions of: “Are we going to win? How are we going to win? How much are we going to win by?” That was the truly exciting part of all that. Each day, each week, the competition and getting ready for it. More so -yeah, the championship game was exciting- but leading up to that was so awesome…a whole year’s worth of stuff that was just so exciting and so intense that it was way more important than the actual championship game. Q: I suppose it’s like your child walking for the first time. Sure it’s nice, but the real exciting part is seeing them slowly grow, day by day, leading up to that moment? Q: Anyone behind the scenes that you feel played a big role in those ’90’s era teams? RG: I don’t know if it was any one person. It was moreover the whole Performance Team that Boyd put together. He did a great job putting a lot of that together and he pushed hard -which made some people mad- but when you put together nutrition and psychology and strength & conditioning and the football coaches and everything, it made for a strong team, combined with a strong team of players. And I shouldn’t forget academics, because those people had a big part of it, too. It was a huge team of people. Q: Do you ever break your rings out? Do you have a favorite? RG: Yeah, I break them out now and then. I think the first one -with the #1 on the top from ’94- is my favorite. I have a collection of all the rings and the watches I’ve gotten since I’ve been here. There’s a lot of them. And to tell you, there were so many guys over the years, so many guys that worked so hard and were such great guys: Pat Englebert, Jim Scott, Terry Connealy, Clinton Childs, all those guys. They worked hard and they gave everything they had. There were so many guys like that over the years. A lot of them. Guys like Randy Gobel will never go out of style. Why? 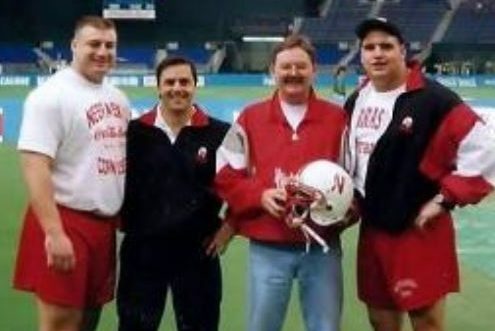 Because seeing through the Nebraskan work ethic, the love of the teaching, the development process, the big games and final tallies, the rings and trophies, he’s a person who simply cares about people. 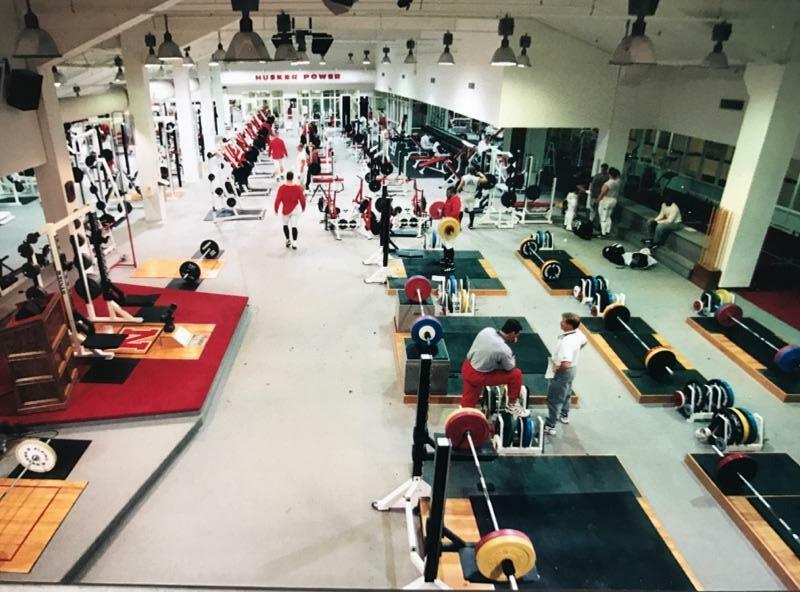 This strength coach truly, humbly, deeply had a heart for every kid down there on the turf sweating away in the humid, summer heat while he trudged up stair upon stair upon stair to set the infamous minute-sixteen clock to countdown mode that champion-building summer of ’94. What stuck out to me the most from our conversation was his “we put together radical things …and we looked at the energy systems football players used and became more sport-specific.” In hindsight, it doesn’t take a genius to realize that you don’t drive a top fuel dragster along Route 66’s 2,448 mile stretch, much like you don’t train a lineman or defensive back to develop only straight line speed over long distances. Football, if you strip it of the glitz, is a game of short, intense bursts of acceleration followed by rapid deceleration and a change of direction, then followed by another short, intense burst of acceleration followed by… well, you get the picture. Plus, every briefly timed play is followed by a prolonged rest period until the next snap. Taking these football-specific facts into account, each and every training routine each and every training day was focused on only those aspects of the game that would be replicated during actual competition. It developed muscle memory and explosiveness that soon became second nature, providing the players with the ability to expend full effort every play knowing that their bodies would be fully primed for the next one after. Confidence skyrocketed as a result. Wasn’t it Vince Lombardi who said, “Fatigue makes cowards of us all”? 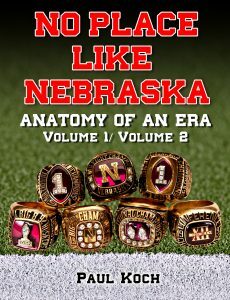 These boys were at their physical peak, so you’d be hard-pressed to find a Cornhusker in those days backing down from Saturday’s skirmishes in cowardice.